This entry was posted on Monday, February 17th, 2014 at 3:32 PM	and tagged with Open, Open Theism, Open Theology, Open View and posted in Uncategorized. You can follow any responses to this entry through the RSS 2.0 feed. Where Can I get this shirt?! It is great! thanks for doing the heavy lifting. interested to read more! I have a half baked position, just curious on all of yours? Hey Tim, good question. My response is probably half baked too. :) I tend to think that God went into creation intending divine incarnation, and also anticipating redemption through it. So, I wouldn’t think of incarnation and redemption as the “alternate plan” but instead the primary plan. In fact, if you look at the first Adam’s God-given mission to enlarge Eden over the whole earth, you might say that redemption, in some sense, actually started prior to the “fall.” Something to think about. A “dummies” guide for understanding open theism? Or maybe the Molinists really did have this figured out a while ago . . . Taking your definition of free-will as “… when we are freely choosing, we could have done other than we did,” and contending, seemingly, that God can’t foreknow freely-caused events defined thus, would you agree that if God chooses to love freely per that same definition “free choice” that God can’t foreknow whether He will love in the future? I’m not seeing how we could contend the one and not the other consistently. Hey Jeff! I’d say from the outset that is important to hold in mind that what I’m describing as open theism is not a question about the extent of God’s knowledge but instead, the ‘content’ of that knowledge. I contend that God’s knowledge is coextensive with reality, so that whatever is true about the world is true about God’s knowledge of it. 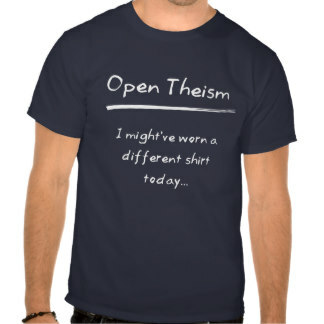 For me, open theism is, at bottom, a theory on ontology not a revision of divine omniscience. I see that this gets missed in most critiques of the view. So, it’s not that God doesn’t “foreknow,” it’s that God foreknows whatever of the future dependent on libertarian free will as possibilities (what might and might not obtain). On God’s freedom… When we’re talking about God’s freedom, I’m not sure we can speak of that in same kind of creaturely catagories of libertarian or compatibilistic freedom. I tend to think of God’s freedom as fundamentally ‘other than’ our freedoms, but in a way that is still inclusive of our modes of freedom, since any sense in which we are free must be ultimately grounded in divine Being from which we come. That being said, “does God foreknow that He will love in the future”? Whether or not God loves now or in the future is grounded in Him, so if it’s true about God, that God will always love, then that’s what God knows about Godself. It seems to me that the very power of open theism is it’s logical consistency with the very definition of free-will you give, which seems to be the only common-sensical one. Take that away from God, and God doesn’t seem to be free in any sense humans can conceive of. I am compelled, therefore, to suppose that God’s benevolence is not voluntary in the only sense of voluntary we can conceive of and that therefore the only obviously free act God has performed was the intention to create. I see you have invested in a shinny new camera.. The Quality is really good now Out of interest I read somewhere that you are set to appear at the olympia this year to pick up some kind of acheievment award. Is this true?Hope to see you there anwoJyohhnFrom Scotland..